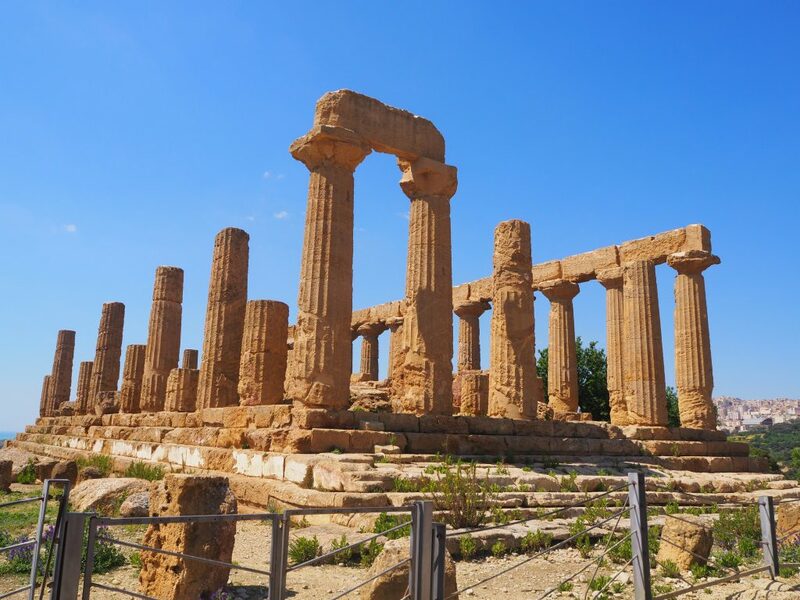 When walking into Sicily’s most famous historical attraction, Valley of the Temples, you wouldn’t be blamed for thinking you had stumbled upon the film set of a historical drama. Gigantic Greek columns rise dramatically from the rugged, windswept backdrops, making tourists feel as though they have stepped back in time to a world where beauty and design went hand in hand. Throughout this archaeological park are scattered eight temples, most of which are impressively intact for their age. These monuments were built between 510 BC and 430 BC. 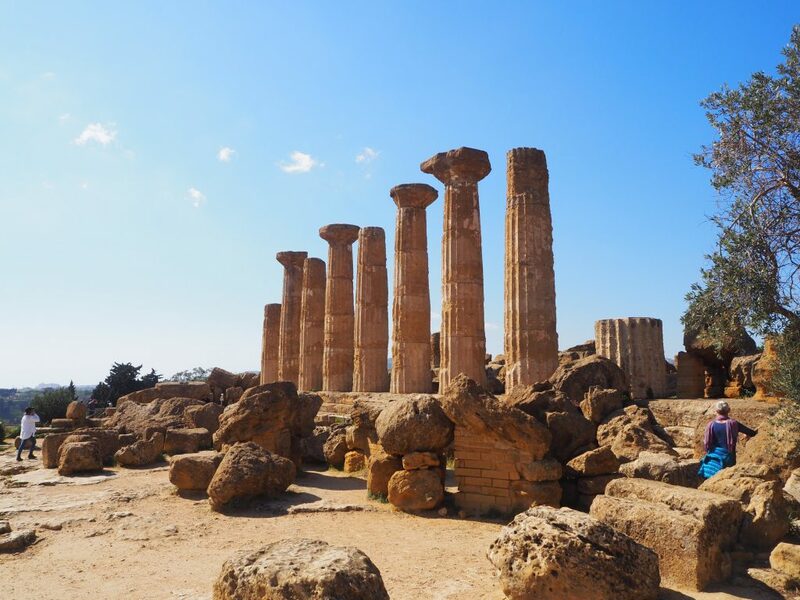 Of the two archaeological parks we visited while in Sicily this was by far the most impressive, but if it gives you a taste for the ancient then why not check out Syracuse’s stunning archaeological park with it’s Greek theatre and Roman ruins lying side by side. The eastern zone of the Valley of the Temples in Sicily is probably the most impressive, containing the three best preserved temples. If you’re short on time you should head here first to be sure not to miss them. The 5th century Tempio di Hera (or Temple of Juno as it is also known), is the first temple you will see as you walk through the eastern entrance. Perched on the edge of a high ridge, you can enjoy this temple along with magnificent views. It is possible to see the long altar inside, which was originally used for sacrifices. 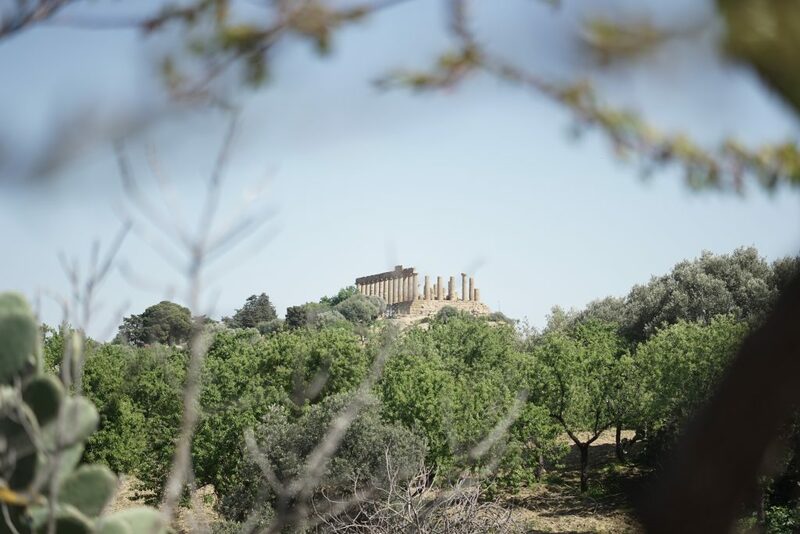 Sadly it was partly destroyed by a fire in 406 BC and repaired by the Romans, but it is still an impressive introduction to the Valley of the Temples and will give you a taste of what is yet to come. 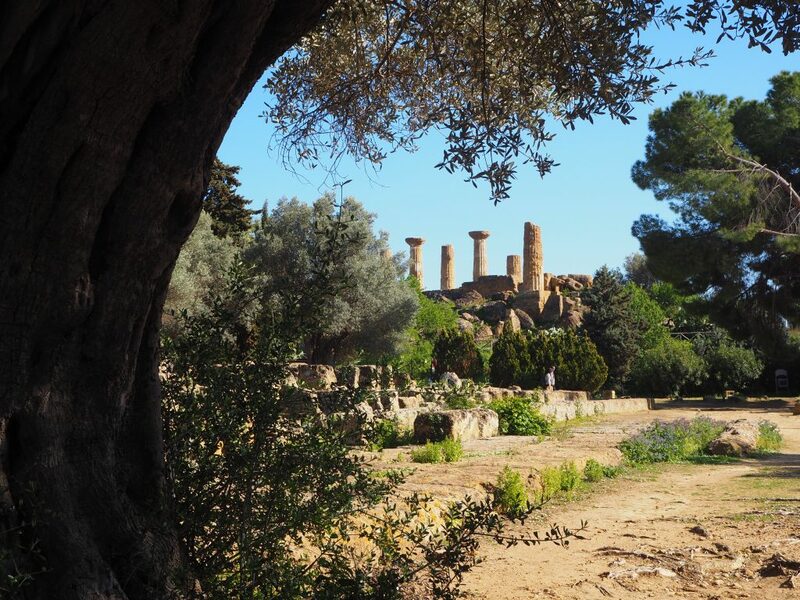 Instead of taking the long, straight path to the next set of temples make sure you duck alongside and walk through the olive grove with it’s stunning views and Byzantine tombs built into the city walls. This will lead you to arguably the most impressive and most photographed structure of the park, Tempio della Concordia (Temple of Concordia). This ridge top temple is one of the best preserved Greek temples discovered and is an incredible site. We could see why some describe the site as one of the must sees across the whole of the Mediterranean. It was later turned into a Christian church, evident from excavated underground tombs. 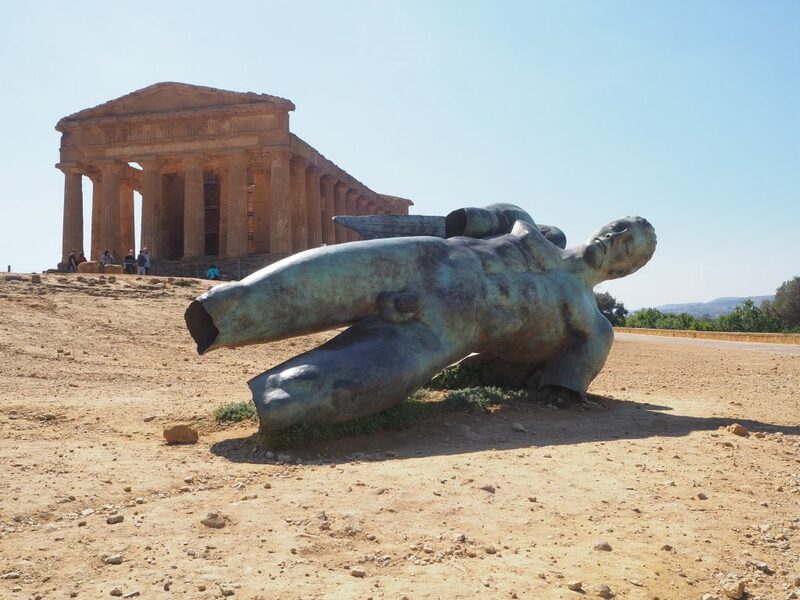 To make the Temple of Concordia even more special, lying next to it is a huge statue of Icarus, with his burnt wings from flying too close to the sun. This modern interpretation of the classical style of staue is all that is left of the 17 statues created around the park by the Polish artist Igor Mitoraj. The Temple of Heracles is the last of the zones temples and is the oldest, dating from the end of 6 BC. It originally had 38 columns of which 8 remain but you can wonder around the ruins here which is a spectacle in itself. The main attraction of the western zone is the ruin of the Temple of Zeus. With an area of 112m by 56m with columns 20m high, this would have been the largest Doric temple ever built had its construction not been halted by the Carthaginians. Now little remains except ruin. 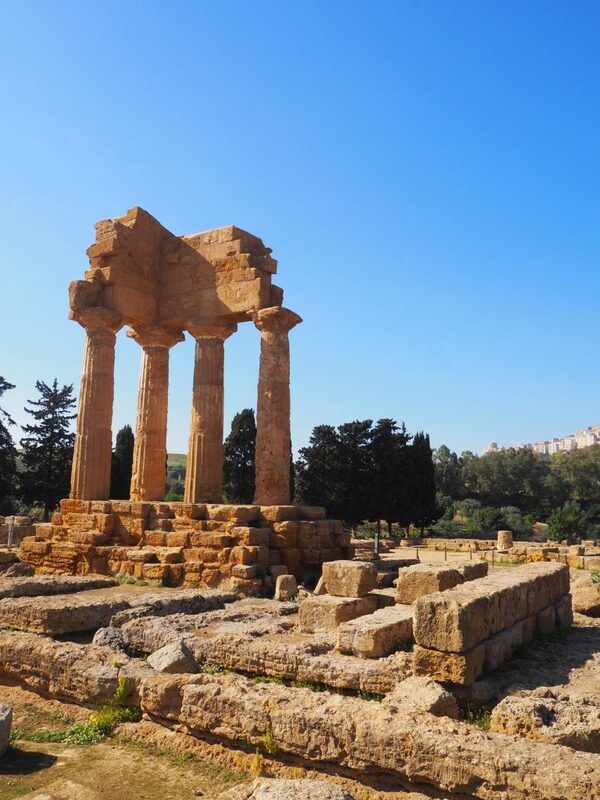 Just around the corner in the Valley of the Temples, Sicily, lies the Temple of Castor and Pollox. It was quiet and peaceful here and there was space to reflect on everything seen throughout the day. This was one of my favourite spots and I sat here for a long time, enjoying being a part of the ancient ruins around me. Aside from the main attractions there is plenty more to explore. The Valley of the Temples is extensive and around every corner is a new, equally beautiful surprise. Anything less than a day here and you will not get to soak it all in, so if you can make sure you spare some time and take your time exploring. If you pay extra for your ticket into the Valley of the Temples in Sicily, you will gain admission to the Gardens of Kolymbetra. As we were on a tight budget we opted out of this and were glad we did. It took hours to walk around the ruins and by the end of the day our feet were sore and we were ready for a long sit down and a cold beer! If you bought a picnic then we heard there are picnic benches and plenty of trees providing welcome shade. We found the website for Valley of the Temples pretty hard to navigate and low on information. Try their facebook page for a little more seasonal detail. Adults-10 euros, or 13.50 for a park ticket including the museum, and 15 euros for the park and gardens. Concession-5 euros, 7 euros including the museum and 9 euros for the park and gardens. Everyday, 8.30-7pm. The park is open later in the summer months and you can see the temples lit up at night. Check their facebook site for up to date info! We enjoyed a day here, and needed it to see everything on offer. But the midday heat makes it hard going so aim to arrive either early or late and make sure you take proper rests throughout! By car-there is parking by the ticket office, 5 euros minimum charge. Bring change for the machine. 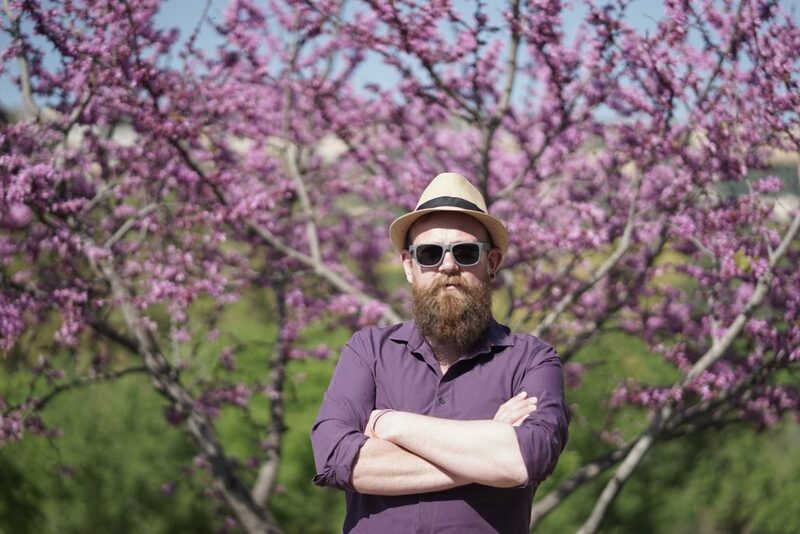 Tours-There are plenty of organised day trips from the main cities around Sicily. It may be a good option if you have not hired a car here. This company offer privately organised tours. 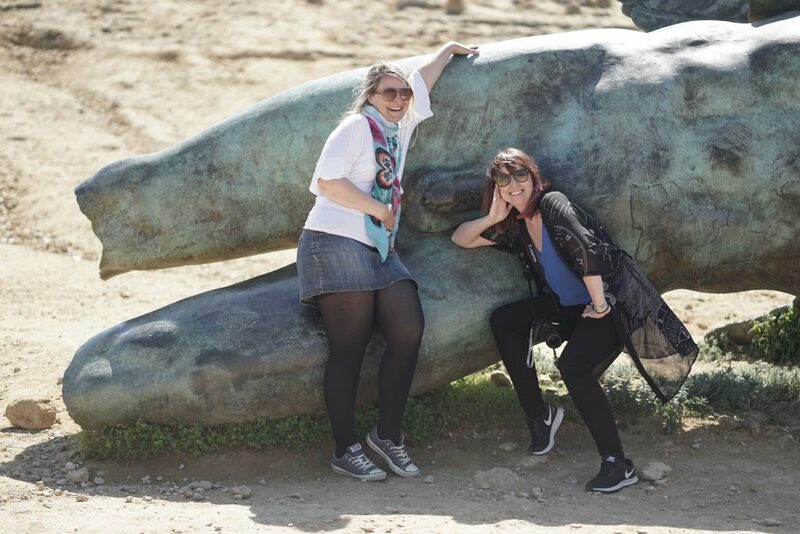 We have found public transport in Sicily to be somewhat lacking. 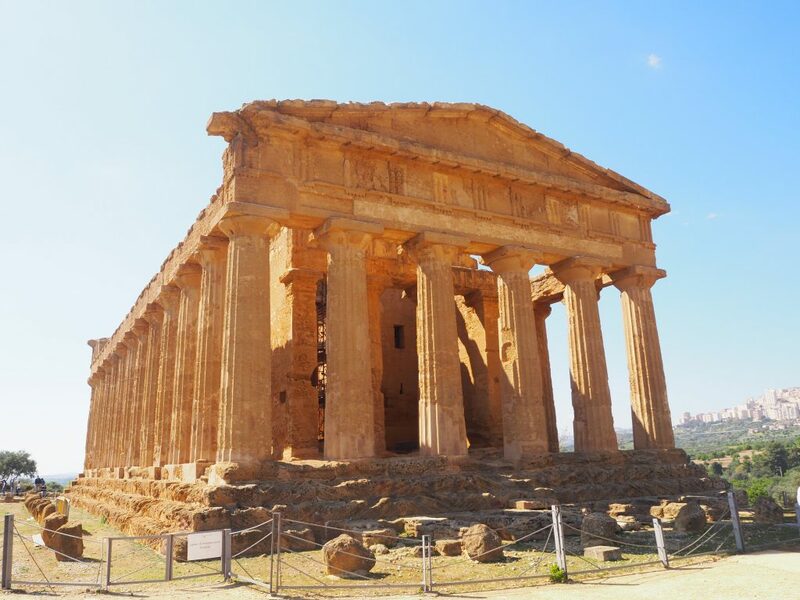 It would be very possible to get to Agrigento if you plan to stay over but much harder to do it all as a day trip. We recommend taking a day tour if you are short on time. There is a well looked after path passing most of the main sites. To get to some of the ruins the ground is uneven and rocky. If the walk from one end of the park to the other (2.5km) is enough for you then it is possible to get a taxi ride back to your car at the other end. The valley of the Temples isn’t actually in a valley, as the name suggests. It is set along a 2.5km ridge which offers little shade for those Sicily summer days. Make sure you take the obvious-water, sun cream, sunhat and snacks. The is a cafe on site that isn’t too ridiculously priced but is still on the expensive side (think 3 euros for a single scoop of ice cream).